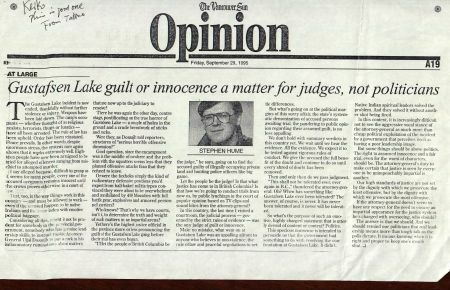 Stephen Hume in The Vancouver Sun, 1995. Opinion on Dosanjh's public relations work on the Gustafsen Lake siege. Ujjal Dosanjh is a questionable choice, for one imposing reason. Twenty years ago, Dosanjh was an elected member of BC’s New Democratic Party government. In August of 1995, he received his first portfolios, most unusually suddenly serving in the posts of Attorney General of BC and Minister for Human Rights, and he was appointed to those roles at the critical moment of an escalating situation near 100 Mile House, the central interior of BC, in Secwepemc country. Within weeks of becoming AG and Minister for Multiculturalism and Human Rights, Dosanjh gave the “green light to shoot to kill” Sundancers at Gustafsen Lake in 1995. Six months ahead of this astonishing directive, the office of BC’s Attorney General had received a powerful legal document from the “terrorists,” as Dosanjh repeatedly referred to them in the press, in Secwepemc country. Their communication was in the form of a petition for a third party hearing of the land dispute between themselves and British Columbia, indeed Canada. The traditionalist Secwepemc nationalists had petitioned the AG because that officer possessed the only existing and appropriate mechanism to deliver the complaint to the Governor General of Canada, who could forward it to The Queen. BC’s Attorney General did not forward the complaint and gave no explanation. Instead, the highest ranking RCMP officers, according to Superintendent Len Olfert during the ensuing trial, began to plan “Operation Wallaby” – a ground assault on a scale not seen since the Korean War – to dislodge the Sundancers from their sacred site by launching offensives from “Camp Zulu” built next to it as the RCMP base of operations. They began this planning in April, according to Olfert; more than two months before the first violent exchanges at the Sundance site were initiated. The first conflict was initiated by a dozen of Lyle James’ cowboys who rode through on horseback, over tents, shooting guns, and posted an eviction notice to a sacred staff which explained it was a good time to “string up some red niggers.” Lyle James possessed a license to graze cattle on the Sundance site. By the time Ujjal Dosanjh was made AG, five months of planning had gone into what would happen next – following the Secwepemc petition and their intended continuation of the annual Sundance. But Dosanjh was the individual who authorized the deployment of 400 RCMP officers with full tactical gear and assault weapons, fixed wing surveillance aircraft, several helicopters, C-4 explosive (in contravention of the UN Convention on the Prohibition of the Use, Stockpiling, Production and Transfer of Anti-Personnel Mines) and requested the use of six Armoured Personnel Carriers from the Canadian military. At the time that these resources were seconded, there were seventeen people at the Sundance site and no evidence that they were in possession of any weapon more powerful than a hunting rifle, nor any demand more extravagant than a court hearing. The police carried AK-47s, AR-15s, and had Brownings which fire 50mm cartridges. When the siege was over, the province had the entire place logged to destroy the trees which were riddled with gunshot and they also saw fit to remove the empty cartridges from the grounds – two piles each the size of a small house. Miraculously, none of the Sundancers were killed. One was shot in the bicep as she fled a police ambush on the way to fetch water; she had been running away back to camp with her hands raised high above her head. After the fact, once the Sundancers had surrendered to police on the advice of their spiritual mentors who were finally allowed entry through the police barricade; once they had been arrested, caged and transported to holding cells in 100 Mile House and Williams Lake; Dosanjh peppered reporters with rhetorical vitriol. He described the foxholes Sundancers had dug at the site to avoid bullets as structures of “serious horrible offensive dimension.” The Attorney General then said to the press, on the matter of the upcoming trial of the Sundancers’ “terror” activities – which apparently included only the fact that they were not willing to be displaced from their sacred site on the strength of a cattle grazing permit issued by BC in unceded Secwepemc territory, “I’ll let the people of British Columbia be the judge.” He had spent the past two months instructing the BC public on the faults and crimes of the Sundancers via CBC and every other media outlet. The RCMP had employed Mike Webster, recently returned from an engagement at the Waco, Texas massacre, as their negotiator. 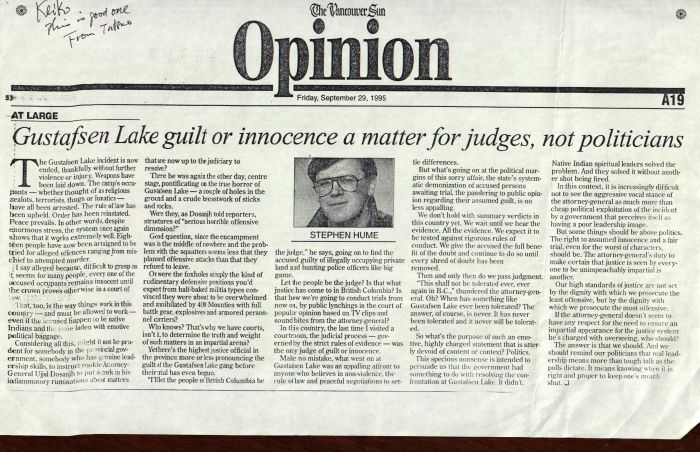 And now the man who was British Columbia’s top legal officer, loudly proclaiming full responsibility for “whatever” might happen during the weeks-long full-frontal assault on the people at the camp at Gustafsen Lake, has received an award for helping “improve the lives of others and society, while defying unjust laws, norms or conventions of the time and place.” He is reported to have explained his qualifications for the honour: “Guns must not be allowed to win. … You can’t have a world ruled by guns…” The selection committee noted that Dosanjh “continues to be a consistent voice for social justice and a critic of sectarian violence.” Apparently the main substance of his suitability for this award was his strong statement, in about 1985, against Sikhs from his homeland using violence to regain independence from Britain. It is a point of wonder, given the first ever recipient of the award in their names, that Raoul Wallenberg and Chiune Sugihara are famous for preventingthe deaths of Jews fleeing Nazi areas before and during the Second World War. Holocaust conditions in Europe have been successfully compared with the modern Canadian institutions of Indian Reserves, the Indian Act and Indian Status, which social/cultural/economic death-traps have repeatedly led to horrifying human tragedies across the state and at other times produced armed resistance such as at Cache Creek in 1974, Oka in 1990 and Ipperwash in 1995. The Convention on the Prevention and Punishment of the Crime of Genocide was nearly written in response to the Nazi modes of operation, at least along the lines of Raphael Lemkin’s response to the Nazi regime and others like it. The 1948 UN Convention categorizes the expressions of this crime against humanity, “acts committed with intent to destroy, in whole or in part, a national, ethnical, racial or religious group,” as: forcible removal of children to another group; killing members of the group; causing serious bodily or mental harm to members of the group; deliberately inflicting on the group conditions of life calculated to bring about its physical destruction in whole or in part; and imposing measures intended to prevent births within the group. 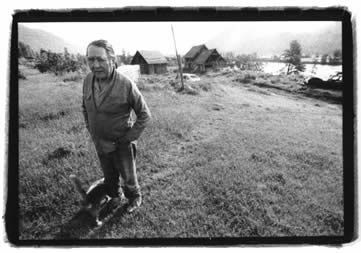 The colonization of British Columbia has involved, and still involves today, actions described by every article in the Genocide Convention. It may be appropriate to recall a few of Dosanjh’s activities following the Gustafsen Lake siege. Just before he became Premier of BC, he participated in a debate over the passage of the Nisga’a Final Agreement with Canada and BC. In that Agreement, the first of its kind in BC, less than half of Nisga’a adults voted to ratify the Agreement which modified their constitutionally protected aboriginal rights. Of the 3300 status Nisgaa adults, 2376 of them “enrolled” in the new Nisgaa Nation which would be created by the Agreement and constituted by Canada. 1451 of them voted in favour of the Agreement. The state considered only the votes of those people who had enrolled in the then-non-existent new Nisgaa nation to be created retroactively by the Final Agreement. Congratulations, George Orwell – the only winner here. Can seem quiet on this site so I thought I'd say thanks. Very interesting bit of history, I was just a kid at the time so it was news to me. Congrats for the award. well such a courage is not so obvious and possible for everyone. so its really appreciable.